Internal bracing structure provides great volume and pickup allows you to gain even more plugged in. 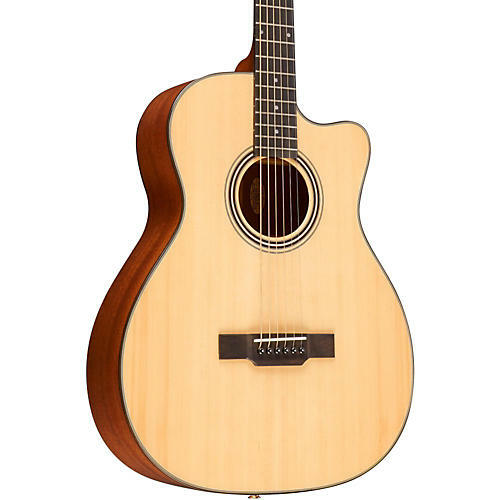 The GBG+ baritone acoustic guitar, has a scale length of 29-1/16″ and tunes a fifth lower (ADGCEA) or sometimes a fourth lower (BEADF#B) than a standard guitar. Numerous fingerstyle guitarists have used these styles of guitars on recordings as it is a superb accompaniment for players and singers wanting a lower range. It uses much heavier gauge strings to compensate for the lower tuning so that the string tension is similar to a standard dreadnaught acoustic guitar. The GBG+’s internal bracing structure is specifically designed for excellent volume and projection. The top is select grade solid Sitka spruce and the mahogany back and sides were chosen for its deep bass response. The radiused ebony fingerboard is perfectly matched to a slightly larger ebony bridge with a genuine bone saddle. The slim line neck contour is only two millimeters thicker at the 12th fret than the 2nd fret allowing for incredible playability up the neck. This guitar features a bolt-on neck design so that future neck adjustments can be done with ease. There are two bolts in the heel of the neck as well as two bolts attaching the fingerboard to the body, which differs from most bolt-on neck guitars that have glued-on fingerboards. No other baritones in this price range have this unique feature, which will assure low string action with the proper saddle height and break angle for exceptional tone for many years to come. The GBG+’s smooth cutaway allows easy access to high frets and includes a transducer pickup system for live amplification.